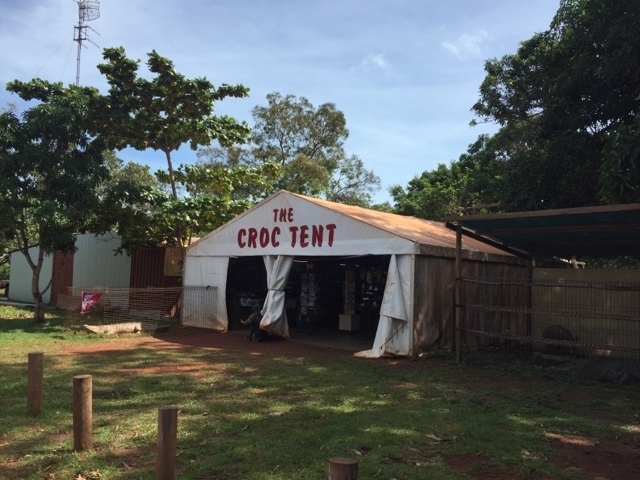 Today we went for a drive to "The Croc Tent" which is a basically a souvenir shop in a tent in the middle of the bush on the way to the tip. I had heard and seen so many recommendations to go here we just had to. Glad we did to as Lea is really helpful and a wealth of information. As we left the tent with souvenirs in hand we headed left for Punsand Bay. 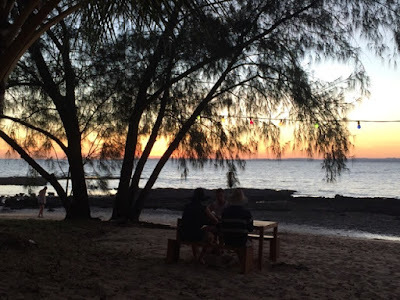 This is where we originally thought we would stay but glad we picked Loyalty Beach as the road in was pretty rugged and you would have to keep travelling it every time you waned to go anywhere. Plus Loyalty was cheaper. The resort at Punsand looked nice, has a good restaurant where we had lunch. They are in the process of completing their pool so it would be hard siting there with a pool full of refreshing water and not being able to get in. 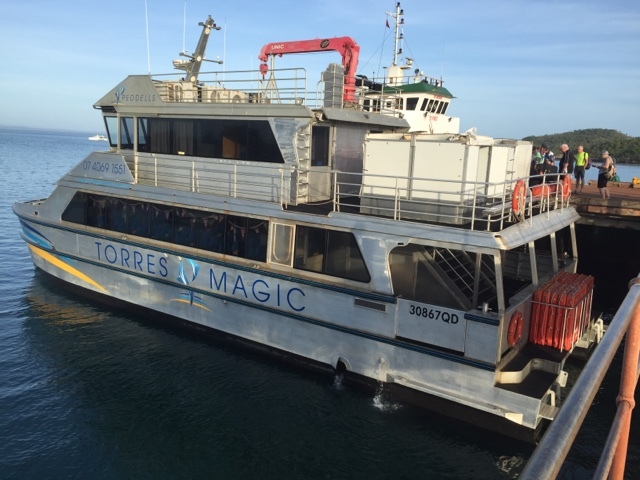 We woke bright and early today for our day trip out to Thursday Island in the Torres Strait Islands. 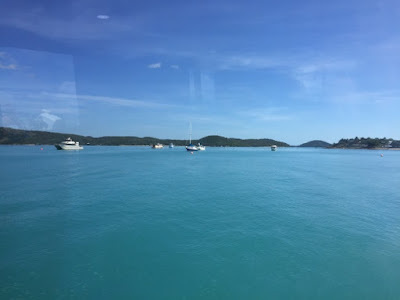 First up was a bus transfer to the wharf, then the Peddells Ferry took us on our 1 hour 10 min trip through all the islands to Thursday Island. Once on the island we were met by our tour guide, a local native named Dirk. Dirk is a Torres Strait native being born and breed on the islands, but went to boarding school for 5 years on the mainland. He is married with children and lives on a glorious little secluded inlet on Prince Edward Island. Each day he sails his little boat over the TI for work. We visited a crayfish factory, one of a few on Thursday Island and the other islands. Next was Green Hill Lookout which was originally built as a lookout for what they thought would be invading Russians. The complex is now a war and maritime museum. The views from the hil are absolutely amazing - looking out over the aqua blue water to the many many islands in the region. The Torres Strait Islands have a population of around 700 with Thursday Island have around 300 of that. The population is made up of about 70% natives and 30% non-natives. As the island was first settled due the abundance of pearls a lot of the population were Japanese. Hence the historic cemetery has around 700 of the 900 Japanese pearl divers who died. The scenery on our return ferry was just as beautiful as the day itself. Even though we were very very tired it was a wonderful day. We decided to have a bit of a quiet day, which was just as well as it is a Sunday and most things are closed - even the Pub. We had to go for a bit of a drive to charge our phones so we decided to go out for a drive to Jackie Jacki Creek and a couple of plane crashes from WW11. The first of the sites was of a Beaufort Bomber that was a little difficult to find but after a drive through the bush we found it. Along the way there were heaps of old rusted 44 gallon drums left by the USA Airforce during WW11. The next wreck was a DC3 Bomber which was a lot easier to find. It was sad to think of the men and woman who lost their lives in these crashes.